The party of the season will be here at All Saints Musicnasium (aka Gym) Saturday March 2nd. 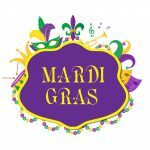 Come party to the music of Corporate Therapy and celebrate Mardi Gras. There’ll be a table-decorating contest for all who want to participate as well as optional costumes for those adventurous to go all out! More than 300 people enjoyed the benefit concert and helped raise money for the Pregnancy Aid Clinic. Don’t miss the fun. Get your tickets today!